I have posted this picture before, but I thought I would let you know how I actually made this image. If you have ever tried to photograph a dandelion (or any other flower) outside, you know that as soon as you have set up your camera on a perfectly calm day, Murphy’s law for photographers will take effect and a breeze will start up. So what to do? 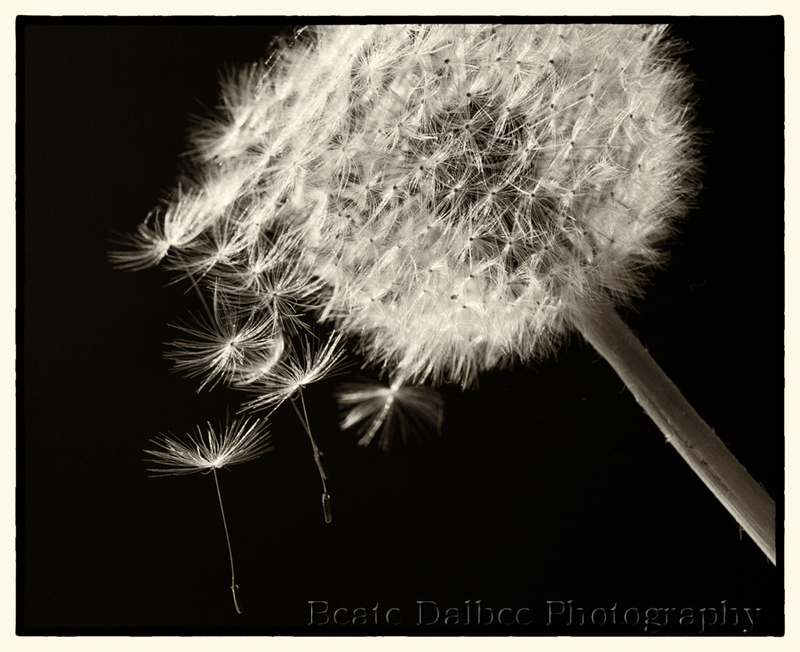 I decided to bring the dandelion inside to photograph it in my living room where some nice soft afternoon light was coming through the door. So I carefully picked the flower trying not to disturb the perfect white fluff. I placed it in a vase, put some black cardboard behind it for background. Then I proceeded to set up my camera. I was looking forward to having some fun photographing it in a nice controlled environment, or so I thought. I had completely forgotten about my dog, who was quietly snoozing in the next room. All the commotion woke her up and she decided to check out why her owner was contorting herself on the living room floor. Before I knew it, she decided to sniff the flower, which immediately started to fall apart. Oh NO! I chased her away and then I took a second look at the dandelion. It actually looked more interesting now than before! She ended up improving my shot! I guess I have a four-legged photography assistant 🙂 . They’re not called “man’s best friend” for nothing! I soo need to get my blog back up and running. Super slacking. But I’ve been busy redesigning my website. Stop by and check it out.